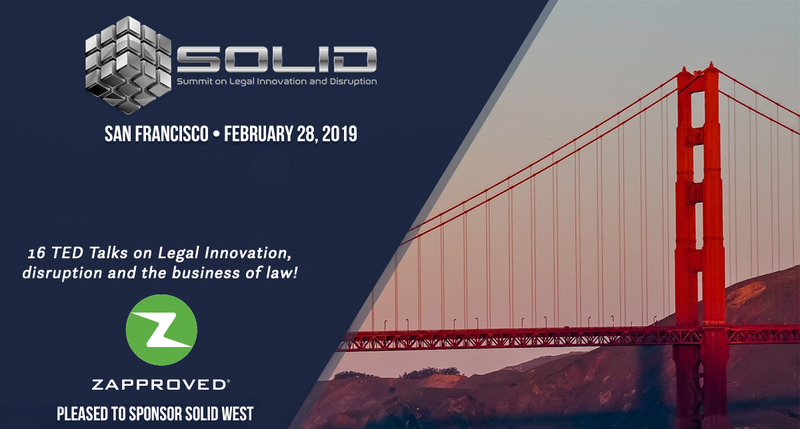 Zapproved is a sponsor of the SOLID Conference, The Summit on Legal Innovation and Disruption. Joining top Corporate Legal Executives & General Counsels in a TED Talk style summit focused on innovation and the business of law. SOLID is a TED Talk style summit focused on innovation and the business of law. Did you ever listen to a great SOLID Talk or panel and wish you had time to engage and brainstorm in real time on how to apply those ideas to your business? 14 speakers will give TED-style talks around the intersection of innovation, advanced technology and the business of law. They share what they are doing, how they are doing it, and the business impact it has. Our talks are followed by facilitated table talks, sprint panels, and town hall discussions, whereby participants discuss what they know now that they did not know before the session started and how to apply these lessons to their own organizations. SOLID provides participants with maximum interaction with peers and colleagues in a round table, workshop environment to assess current challenges and design concrete solutions.